Versatile former Sheffield Wednesday starlet Drew Talbot has admitted he’s delighted to be back at Chesterfield - and very much in boss Paul Cook’s thoughts. Talbot had a loan spell at Plymouth but has played in the last three games for Chesterfield, and he said: “I feel brilliant. The whole idea of me to go out on loan was to get minutes and get my match fitness up. 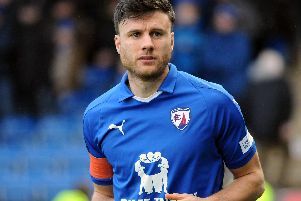 “I’m glad to be playing for Chesterfield again, it was a period of time when I didn’t think I’d be playing again so I’m grateful to Plymouth for what they did for me and I’m grateful to be back here playing again. Of the mood in the camp after the defeat at Peterborough he said: “Everyone’s a bit deflated, we started off brilliantly in the first half and hour but couldn’t get the goal. Then they scored a fortunate goal - probably a bit sloppy from us. Spireites host Walsall on Saturday.